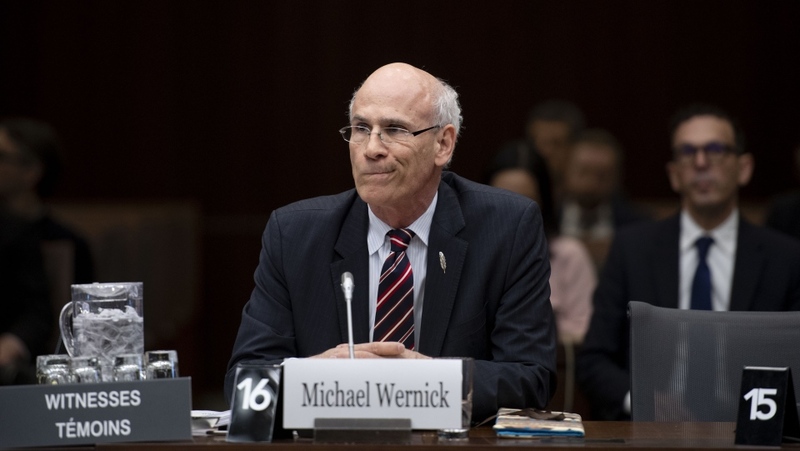 OTTAWA -- Privy Council Clerk Michael Wernick has delivered his second and sometimes terse round of testimony on the SNC-Lavalin scandal, in which he denied accusations he is partisan, or that he ever made any threats to Jody Wilson-Raybould over her handling of the criminal case against the Quebec company, as she had alleged. He and Deputy Minister for Justice Nathalie Drouin appeared before the House Justice Committee for just over two hours on Wednesday afternoon to elaborate on their previous testimony, which was given prior to Wilson-Raybould’s appearance last week. “I never raised partisan considerations at any time. I reminded her repeatedly she was the final decision-maker. I did not attempt to influence her decision. I was giving her relevant context… and I never suggested consequences for her,” Wernick said. During her testimony, Wilson-Raybould alleged that she faced high-level "veiled threats" and "sustained" political interference from nearly a dozen senior officials between September and December 2018 -- including Wernick and former principal secretary Gerald Butts -- to seek a deferred prosecution agreement for SNC-Lavalin, which is facing bribery and corruption charges over business dealings in Libya. She also referenced various conversations she had with Drouin on this case. Among the interactions with Wernick, Wilson-Raybould recounted one phone call in which she says that he sought to know whether her thinking had changed about pursuing a deferred prosecution agreement. On Wednesday, Wernick had an entirely different view of that conversation. “The minister experienced lawful advocacy to consider doing something lawful in the public interest. I made no threats, veiled or otherwise, that the minister’s decision would lead to consequences for her…It is my contention the minister was doing her job and I was doing mine,” he said. In his first appearance, Wernick disputed the allegations that Wilson-Raybould had not yet publicly addressed, saying that the pressure she felt wasn't "inappropriate,” and that those involved were providing her with “context” about the implications of the continuing criminal case. He also then offered a series of comments that the opposition saw as indicative of him crossing the line with his involvement in conversations about SNC-Lavalin. On Wednesday he doubled down on chalking his conversations up to “context,” saying that he had a responsibility to inform Wilson-Raybould about the changing circumstances around the criminal case, like the company’s economic outlook, or the prospect of the issue being raised as part of the Quebec provincial election. “I did not do so out of partisan considerations,” Wernick said. At times the testimony was tense, as Wernick faced questions from opposition MPs who have called for his resignation over his involvement and remarks on this case. In response to some of the more heated exchanges, Wernick offered one-word responses. And at one point, when asked about recollecting precisely what was said, he replied that he did not wear a “wire” during his meetings so he has no audio recordings of them. In his opening remarks on Wednesday, Wernick began by denying that he's acted in a partisan way, as the opposition parties have accused following his initial committee appearance. He said he is "profoundly" disappointed by these accusations from people who do not know him. Wernick’s denials of partisanship came as cold comfort to the opposition MPs on committee who weren’t buying it. “I think your evidence is consistent with being willing to interfere in a partisan fashion for whoever is in power,” said Green Party Leader Elizabeth May. Wernick presented a stack of documents which he said were records of disparaging things said about him on social media since his last committee appearance. He said he considered this “intimidation” of a witness, and stood by his earlier pronouncements about the state of online discourse, partisanship and the prospect of political assassinations. He also said that the online “cyberbullying” of political officials, which he has been subjected to, angers him. He argued that raising this was relevant given that it’s happening in this case. Wernick also addressed Wilson-Raybould’s allegation that the days before the January cabinet shuffle her former deputy minister was called by Wernick, who told her that one of the first conversations that her replacement, later named as Quebec MP David Lametti, would be having in his new role was on the SNC-Lavalin file. He said that he told Drouin that his conversation was part of a round of calls in anticipation of the shuffle to all affected deputy ministers, in which he said he requested that officials be ready to brief Lametti on SNC-Lavalin, along with several other “live” files, as Drouin put it. During Drouin’s remarks, she told the committee that she was asked by the minister’s office when Wilson-Raybould was at the helm to hold back a report to the PCO about the consequences a criminal conviction may have on SNC-Lavalin. Drouin, who is the top bureaucrat at the Justice Department, said that the Privy Council Office had asked for the report in October but it wasn’t provided at the request of Wilson-Raybould’s office. This note was raised as part of her overall testimony which detailed dates when she briefed or spoke to Wilson-Raybould—whom she said she had a positive working relationship with— about the SNC-Lavalin case and her authorities as an attorney general. She also told the committee that in September, Wilson-Raybould told her she was not interested in intervening in the case just days after the Director of Public Prosecutions Kathleen Roussel outlined her reasons for not pursuing a deferred prosecution against SNC-Lavalin. Then, just days after being informed of this determination, Drouin said Wilson-Raybould told her it would be the last the two discussed the matter. The two senior staffers’ appearance followed Butts, the former principal secretary to Prime Minister Justin Trudeau, who spent just over two hours before the committee saying he is confident that “nothing happened” outside the normal scope of government business in regards to the SNC-Lavalin case, and that he can’t see how his or others’ interactions with Wilson-Raybould on the file could constitute pressure. Asked to comment on Wernick's involvement in this matter, Butts said on Wednesday morning that he finds the accusations levelled against Canada’s top civil servant "completely inconsistent with his character." "He has made enormous family and personal sacrifices to continue to serve the people of Canada. I just can’t imagine a circumstance where Michael Wernick would do the things he is alleged to have done. I find that even less credible given the fact I am alleged to have done things I know I didn’t do," Butts said. The meeting ended with the Liberal majority voting to not hold another meeting on the matter until March 19, which is federal budget day. Then, MPs on the committee will assemble—likely behind closed doors—to discuss potential next steps and future witnesses. The opposition wanted to call Wilson-Raybould again— as she issued a statement Wednesday afternoon declaring her openness to re-appear—and several other senior staffers who continue to be referenced in the testimony the committee has been hearing. On their way out of the committee, opposition MPs expressed their frustration with what they feel is an impossibility to get to the truth through the committee process. “I have no idea what is going on with whatever strategy they have or they don’t have,” said Conservative Deputy Leader Lisa Raitt of her Liberal colleagues. “Although little by little we’re getting more information,” Raitt added. Reading on an app? Tap here for full experience.